In The Bridge to the 21st Century: Reflections on the Soul of a Nation, author Cary Coole ponders the development of two Americas. One is founded in the past with strong rooted values from our national heritage; the other America began emerging during the sixties and seventies. In this new America, traditional American values are constantly being assaulted. Let’s begin by simply reflecting back on our past…the past one hundred years, particularly the past fifty years. Many might be surprised. Starting on New Year's Eve, turn of the century, Coole takes us on a tug-of-war for the soul of a nation. Part memoir and part history, this is a look at America not from the bastions of academia, but from the spirit of the heartland. 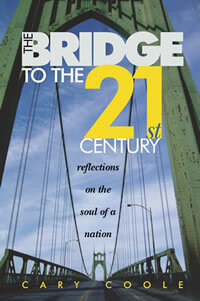 “I enjoyed [The Bridge to the 21st Century] immensely and was educated and captivated at the same time. You have struck a perfect balance between illustrating history and its impact…my generation has much to profit from your book. We are dealing with a generation that does not really read that much and has fallen into the Internet habit of instant news and then only those that interest them or their pursuits. The book is the ‘silver bullet’ for my generation. History in a dry textbook format has left a bad taste in our mouths. I believe there is a need and an unspoken desire to relate to and understand our role and ‘duties’ to America. We realize that without a proper road map to help us understand our origins, we are destined to fail. It is this unspoken desire that this book taps into.